Islanders website: Joshua A. Bernstein has the recap of the Islanders win with comments from head coach Scott Gordon on a sixty minute game besides the penalties that made it tough on themselves in the third. Gordon also felt the system, skating and work ethic is becoming is more instinctive as he praised his players and singled out Josh Bailey for his poise with the puck. Bailey talks about his first NHL point. 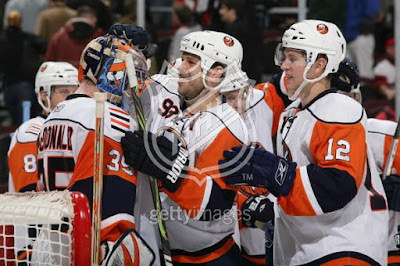 Sports Network: Has the recap of the Islanders 3-1 win in Ottawa against the Senators Thursday. AP: Has the recap of the Islanders win along with the Canadian Press here. Point Blank: Mr Botta's blog talked about the win and the youth movement moving forward as it related to some of the efforts tonight. Highest marks to Joey MacDonald who had a great game, kept the rebounds in front of him with solid positioning and did not allow the Senators a lot of second chances. Sens get buzzing down low coming it's tough to contain. Islanders as badly as they needed a win made this much harder than than it should have in the third period with those penalties. Five minutes for an elbow on Pock and Sutton-Spezza raising sticks together? Very questionable calls especially after someone hit Streit in the second after he hit someone for a penalty and no retaliation? Sure seemed like officials in Toronto was reaching with that goal replay in the final minutes, no one came close to reacting like that puck was in. Ottawa had the speed and the chances but Islanders got in the lanes and did not make it easy, seemed most of the game the Sens looked for that point shot which got them the lead very early after a good opening minute by Bergenheim-Weight-Guerin. On the Islanders side easy goal for Okposo but nice hands and composure for Bailey to find him in the right spot for his first point. This kid has the soft hands and you see the passes have a touch and timing which is a level above. Just as impressive was Okposo finding Bailey at the end of the Islanders first powerplay at the top of the slot that drew the next powerplay that led to the Isles first goal, Tambellini put the puck into Nielsen's skates at center ice before that. A lot of gutty play from the club overall. Sim drove the net and when you see a player come out quickly from an angle and crash the crease you know it's him. Bergenheim again had a very visible game finding Weight early and almost scoring shorthanded at the end of the second period. Hunter did what he does best, dive and block shots and drive the net, he's doing what he has to do and it's paying off with hard-working goals. Very nice play lifting Kuba's stick and slamming the puck in for the 2-1 goal. It's not 03-04 but it's a player with a hard shot getting in the tough areas and making plays in all three zones. Nielsen's speed is good for him. Guerin again too many low percentage shots but Weight found him for a high percentage chance, begs the question should Weight play forward with the powerplay? Nielsen even when he is not in on the scoring is always visible and doing something with his backchecking or keying a rush and more confident with every game, tonight his hard work drew powerplays by skating. Streit had his chances, Campoli took the point shot for Okposo's goal. Skinner just stays in position and makes plays without costing the club, Pock outside of his elbow made a lot of big clears shorthanded as did Gervais. Sutton had some big hits and was solid. skilled as the come in Alfredsson, Spezza (who was going for the perfect play) and Heatley. Kuba also looked very effective and the Islander forwards took the punishment from Volchenkov. That one chance on a bad change where Nick Foligno almost beat them is unacceptable and a very bad trend. Like how Gordon got animated with a few players and Weight with a few smiles and exchanges with the young players. I would keep Okposo and Bailey together. Howie Rose seemed a little too excited to remind everyone about the Islanders third periods and did not react to a few big saves or shots both ways and just kept talking over the play or simply note a save. Islanders can skate with that team, they can skate with anyone. Sloppy at times for both sides but what a difference from the Coliseum ice. Game two of the home and home is Saturday, are they really going to suspend Tomas Pock with a straight face?